A huge Bwoom Helmet mask from the Bushoong Kuba people of the D.R. Congo. According to legend, Bwoom was sent to Earth by his father (the great God Woot), to establish the Kuba kingdom. This enormous example is 17” high, 12” wide and is masterfully carved. The face is decorated with inlaid beads and has a finely polished patina. An impressive example with great presence. Comes with custom stand. 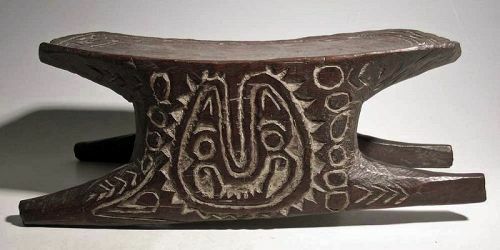 An excellent carver's stool from the April River area of Papua New Guinea, early 1900's. It is 14-1/2” long and is nicely carved on all sides. A well-detailed fox head surrounded by geometric designs decorates one side, while a typical tribal symbol covers the other. The seat itself is surrounded by a serpent design. Lovely patina. A well-used lime container from Timor. It is 7-1/2” long and is made from two sections of bamboo. It is elaborately decorated with intricately incised figural and geometric designs. The container has a lovely patina from extensive handling and contains remnants of lime. An excellent Gope paddle-type staff from the Papuan Gulf area of Papua New Guinea. It is 29-1/2” long and is decorated with boldly carved designs characteristic of the type. Much of the red and white pigment used to highlight the designs remains. 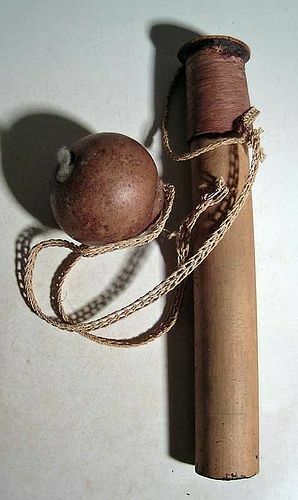 A fine blow gun dart kit from the Amazon region of Brazil. It is 9-1/2” long, is made from bamboo with a bark lid and is filled with darts. The hollow gourd is filled with fiber (cotton?) used to wrap the darts and is attached to the nicely woven strap. A superbly carved Hemba fly whisk from the D.R. Congo region, ca. early 20th century. Overall length is 13”, with the hollowed out head designed to hold another object. Lovely patina from extensive usage. A choice Ogboni Society figure from the Yoruba peoples of Nigeria, West Africa, early 20th Century. This finely sculpted bronze figure is 5” high and depicts a kneeling female with hands clasped. She is adorned with a fancy headdress and a necklace with a pendant in the form of a soul disk. Beautifully detailed, nice patina.